Facebook Messenger now offers users mental health support, in the shape of chatbot Woebot. The online chatbot is developed by Stanford researchers and there for everyone who wants to talk about depression and anxiety. The bot uses cognitive-behavioral therapy to help users change unhelpful thought patterns. 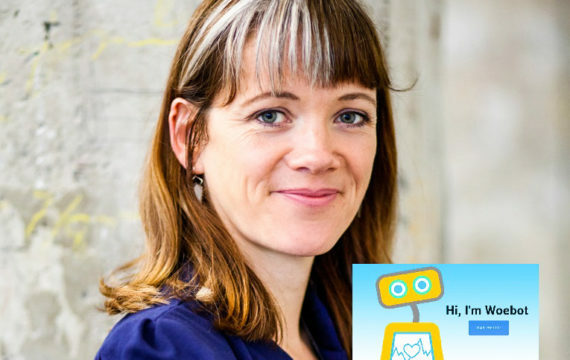 Woebot is the brainchild of Dr. Alison Darcy, now CEO of Woebot Labs. Darcy is a clinical psychologist at Stanford University, who has been working on the chatbot for quite some time now. Woebot is now available through Facebook Messenger and offers advice to anyone who seeks out its help. The chatbot uses cognitive-behavioral therapy (CBT), a therapy focussed on developing coping techniques. It is based on improving everyday life, by helping people change unhelpful thought and behavioural patterns. The therapy is usually guided by a licensed mental health professional. However, seeing a therapist can be quite expensive, especially in the USA. Woebot uses CBT techniques, and applies them online for a lot less money. After a two-week free trial, the service costs $39 per month. Woebot is fully robotic, and not shy about it. Making the bot fully automated has a couple of great advantages, the first being 24/7 availability. Another is the privacy this offers. Without a human needed, Woebot can ensure its users that their messages stay between them. This is a good thing, since the robot is based on conversation: the robot functions as a friend checking in. Woebot doesn’t judge, so people can share their most personal thought without fear. The bot will ask about the users mood and thoughts. When these are negative, the bot uses CBT techniques to help reframe thought patterns. The techniques are usually thought exercises, to learn users to look at current events in their life differently. It is important to note that Woebot does not diagnose users. It doesn’t suggest medication or treatments. It is simply a chatbot which understands the words a user types and offers the right kind of support. Each conversation will be a little bit different, since Woebot remembers who you are and what you’ve talked about in previous conversations. Just getting the problems out of people’s heads is the first step in coping with current problems and emotions. Whenever a person seems at risk, Woebot will direct them to the appropriate resources, like the National Suicide hotline. A logical question to ask would be: but can a robot be just as effective as a licensed human? A recent study published by Swedish, Dutch and German researchers compared online CBT directly to face-to-face delivered CBT. The conclusion? Both ways produced the same overall effects. Still, Woebot isn’t developed to replace traditional therapy. It’s meant as an extra tool, something easy to access by those who don’t feel comfortable visiting a therapist — for whatever reason. To test the chatbot, Darcy conducted a randomized trial amongst 70 undergraduate and graduate students at Stanford. The students would use either Woebot or a self-help e-book over a two-week period. The results were positive: people used Woebot almost every day and reported high levels of satisfaction. They also did not mind using the bot through Facebook Messenger. At one point, the team does want to release a standalone app, but for now the focus is on making sure Woebot becomes well-known.